The pacific northwest is on fire! 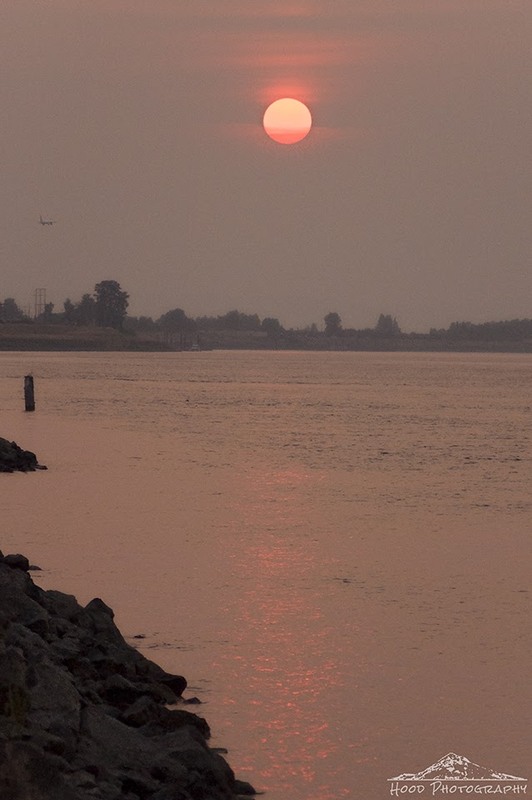 There are so many wildfires burning that the past two days, the majority of the skies in the states of Washington and Oregon have been obscured by smoke. The second you go outside you can smell it. The past two nights have produced a bright red sun during the half hour or so before it goes down. I went down to the Columbia River and took this on Sunday night. Beautiful sunset. I hope the fires go out soon, or some rain comes that way! Happy Monday! Ugh....the only thing this smoke is good for is creating pretty sunsets. Nice shot! Too bad that a disaster causes such beauty! The discomfort and devastation caused by these fires is difficult for us to comprehend here in the UK. Hope you get some rain soon to help extinguish the problem. Super sunset. Beautiful indeed. Some of the smoke in British Columbia made it all the way out to Ontario earlier in the summer and influenced our sunsets for a number of days. The red sun is beautiful but I wish you had no fires. I have been reading about this today. Though the sunset is beautiful the fires and the drought conditions are so horrible and frightening. While the photo is beautiful and mysterious looking, please take care with all that smoke and fires. I tried to photograph a red sun tonight, but I'm not happy with the result. It's not quite the same over a town...even a little one such as Elgin! Today, the smoke was heavy..."unhealthy" air quality again. To me, it's all so sad because I am aware of what is happening. Your sun photo is a beautiful one. Wow, gorgeous picture! What an amazing evening sky, with a nice reflection in the river!